Law Enforcement a la Carte. Security Service of Ukraine (SSU) is investigating legality of the work of IT companies and enjoy large scale freedom in choosing the instruments of such inquiries. Since early 2010 there have been dozens of searches, hundreds of confiscated items of equipment, millions in losses for the industry in Ukraine. Many companies, among of which are Adamant, Lucky Labs, KM Core, and V.O.K.S., have suffered from increased attention of the security forces. What are the real motives of the searches? Why has countering crime in the industry has been named the ‘IT-genocide’ in Ukraine? In May 2016 the French tax authorities and the team investigating serious financial crimes came with a search warrant to the Paris office of Google Corporation. The reason was that local authorities failed to receive about $1.6 billion in taxes due to alleged use of “aggressive methods of tax optimization”. IT-giants like Apple, Yahoo, Microsoft, Amazon also use similar methods of tax planning. In line with these events European Commission adopted a draft directive on tax evasion on June 21, 2016. The regulation deemed to significantly limit possibilities of using such practices by the IT-companies. While EU authorities work to bring IT business giants in line with traditionally egalitarian view of social security and tax duties, some countries still experience weak rule of law and insecurity for the business. Ukrainian security forces fight against economic crimes through searches without making appropriate amendments to the national legislation on criminal procedure. Since 2010 Security Service of Ukraine has launched a large investigation program towards big IT-companies, which were suspected in tax evasion and other crimes. While some cases proved to be justified, transparent IT business was also targeted, while not having any instruments of protection at the legislative level. According to the estimates of the IT Ukraine, losses from such searches estimated to about $10-20 million. There are plenty of examples when law enforcement authorities act in a grossly inappropriate way during the numerous searches in the IT-companies. For instance, Office on countering economic crimes raided IT-company Infotek based in Zaporozhe on September 23, 2014. Security officials claimed that their actions were based on the FBI request of information to probe the company vis-a-vis the case of money theft from the US bank. According to the SSU, Infotek allegedly set up and administered Trojan virus, which damaged banking systems dramatically. Infotek CEO Mark Marchenko on his part suggested that law enforcement officers just wanted money from the company, as they proposed “to look for the ways to solve the problem on the spot”. A few days later the conflict was resolved, and work of Infotek has resumed. Apparently, solutions were found. In 2016 SSU officers and soldiers of Special Forces Alfa paid a visit to a group of companies Adamant. As it was said to the head of corporate security, the law enforcement authorities came to remove the equipment of one of the clients, who rented a place in the company’s server rack. The company owner Ivan Petukhov has his own opinion about what has happened. He is sure that the Security Service visit was an act of pressure, and it happened because of his public activity: Petukhov has never hesitated to defend his civil position and openly criticized the government, including the Security Service. From his point of view, this visit was aimed to make him rethink his behavior. In turn, Petukhov called these actions an ‘IT-genocide’. Another recent story features Lucky Labs company, which was accused of financing terrorism and administering gambling business in Ukraine. Security Service of Ukraine (SSU) searched the company twice – in October 2015 and in April 2016. As a matter of fact, dates of the searches surprisingly coincided with the course of litigation between the founders of the Lucky Labs and their former partner Max Polyakov. The story of Polyakobv’s dishonest attitude towards his ex-partners even appeared on the pages of the authoritative American edition “The Huffington Post”. The author concluded that the SSU visit to the Lucky Labs may have been Polyakov`s instrument of pressure. In Ukraine, on their part, sources close to the businessmen, do suggest that “it is Polyakov who stands behind the visits of the Security Service to Lucky Labs”. As the case later showed, Max Polyakov has also initiated a series of information attacks on the company, which has been going on for months. Polyakov’s contacts allow him to post defamatory materials on his competitors in authoritative media resources and to block any kind of information showing another side of the story. For example, searches in Lucky Labs have received a lot of attention from the authoritative online resource majoring in IT – www.ain.ua. After the change of the Board members of AIN.UA in February 2016, when Ilya Boshniakov has become the new CEO and co-owner, all the news about Lucky Labs acquired highly negative connotation. There is no surprise as previously Boshniakov worked with Polyakov in Cupid Plc: he supervised HR function for the company. Some of Boshnyakov’s work was previously under a great attention of the media after the BBC Radio 5 has published the investigation. According to it, Cupid Plc had been hiring staff in Ukraine to lure clients into paying more on dating online platforms. Another Polyakov’s partner, Maxim Krippa, provides him with media support, too. Previously, he ran for the Kyiv City Council with Samopomich party, while at the moment Krippa sometimes allows himself to allocate media budget of affiliate political force to feed certain resources in exchange for refusal to write about certain people. Similar reasons, associated with the competition, can be hidden behind the search in the house of Vadim Sidorenko – the co-owner and director of the company Content Delivery Network, which is associated with Triolan Group. Technically, the company was accused of tax evasion. All equipment, cash and bank cards were confiscated. But Sidorenko claims that it is revenge from competitors for lower tariffs on same services. 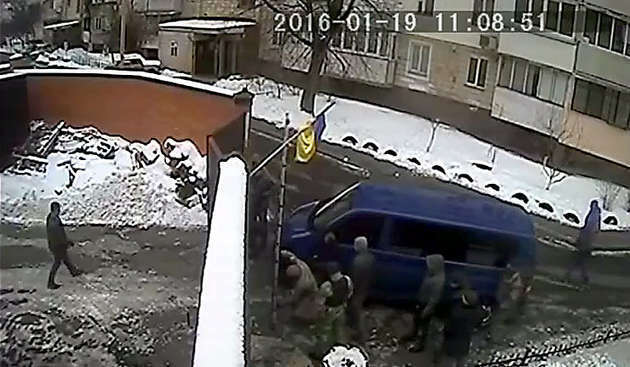 Also, on March 11, 2016 Security Service suspected another business in financing terrorism. This time Lviv company IT-Sfera hit under the search. The reason was that the contractor, who bought a software from the company in 2013, was registered in now war torn Donetsk region. Sometimes, security forces simply come to the ‘wrong door’. For example, employees of Kharkov Tax Service mistakenly have conducted a search in Kharkov IT-company Promodo in January 2016. The search lasted for an hour, while later they just apologized and moved to another office in the same building. The last case that looks much like the previous one is the search in the KM Core. On August 22, 2016 Prosecutor General’s Office of Ukraine conducted seizure of documents in the office of Yuarms owned by the founder of Kvazar-Micro (holding KM Core) and well-known businessman Evgeny Utkin. According to Utkin, security forces broke down the door to the office. As it turned out, law enforcement officials simply ‘confused’ the address. Head of the company managed to meet on this issue with the President of Ukraine. Petro Poroshenko himself is concerned about this state of things: “Those messages in the media we had about the searches, ‘raids’ on the IT-companies, benefit neither the state nor to the image of Ukraine in the world, nor to restoring of justice. Maybe there is a problem with the fact that someone uses benefits and support wich the state provides to the IT industry for other purposes, but it’s necessary to deal with it not through searches in well-known IT-companies”, said Poroshenko on 6th of July 6 in 2016 while meeting with leaders of successful Ukrainian startups. Sadly enough, while the guilt of IT-companies has been proven in none of the cases, the attempts to prove it have destroyed the business itself as well as its reputation in most of the cases. The question is, how to stop it? The Ukrainian Parliament has recently adopted draft law №1580 on deregulation of business. Draft Law makes changes to the Criminal Procedural Code of Ukraine in terms of such investigative actions as a ‘search‘. From the date this law will come into force, it is impossible for the law enforcement authorities to pressure IT-business any more. MP Vladislav Golub commented on the law: “As recent events have shown, unfortunately, our law enforcement agencies sometimes abuse the right for a search and thereby stop the operation of companies. On the other hand, we are squeezing this sector of the economy of Ukraine, and IT-industry is looking for another jurisdiction where the comfort zone for them is profitable”. This law will concern not only IT-industry, but will cover a wider sphere. For example, it will not be allowed to confiscate the servers in the IT-companies and other companies using electronic information systems. The search itself, as well as the temporary confiscation, will be only possible when a device of an electronic information system is the subject of committing a crime. However, it would be logical to assume that there should be a direct evidence first in order to make such accusations. Moreover, the law will forbid using special forces such as Alfa for the search, which was often practiced before. Now it will be possible to use special forces only in case of serious or particularly serious crime, rather than in the case of speculation about tax evasion, financing of terrorism or other false accusations. The law also provides a lawyer present during the search, rather than after its completion as it is happening now. According to the honored lawyer of Ukraine and expert of the Venice Commission Maryna Stavniychuk, the draft law on the special confiscation in the current edition is aimed at taking away and redistribution of property and has no right to exist. The 20th of September was declared ‘a day of IT in Parliament’ in 2016. Verkhovna Rada of Ukraine held a meeting devoted to information and communication technologies. While thr MPs supported four of the five relevant laws considered, Security Service made more than 10 raids in Kiev IT-companies, including office of internet provider V.O.K.S. Indeed, the adoption of new laws regulating the activities of IT companies, gives hope to improve prospects for the industry in the Ukrainian legal field. However, it is till unclear whether representatives of the executive authorities will adhere strictly to these standards.